Happisburgh, pronounced, famously, Hayz-br'h, is a delightful village close to the north east Norfolk coast. Having said that, this is not the fashionable Norfolk coast beloved of the colour supplements and the Islington set, but the caravan site strip, and we are within a mile or so of the vast North Sea gas terminal at Bacton. St Mary provides a strong, serious repost to all this modern ugliness, and has one of the dozen best towers in all Norfolk. Only Cromer is higher. The tower works by its division into four stages rather than the more usual three, with solid buttressing tapering as it climbs the corners. But in a way, it is meaningless to compare St Mary with other churches. What is special here is the whole piece, the great bluff of the churchyard, the village street below, the candy-striped lighthouse off to the south. The sheer bulk of something that borders on the organic, but also a last bastion of the made world confronting the wild North Sea. 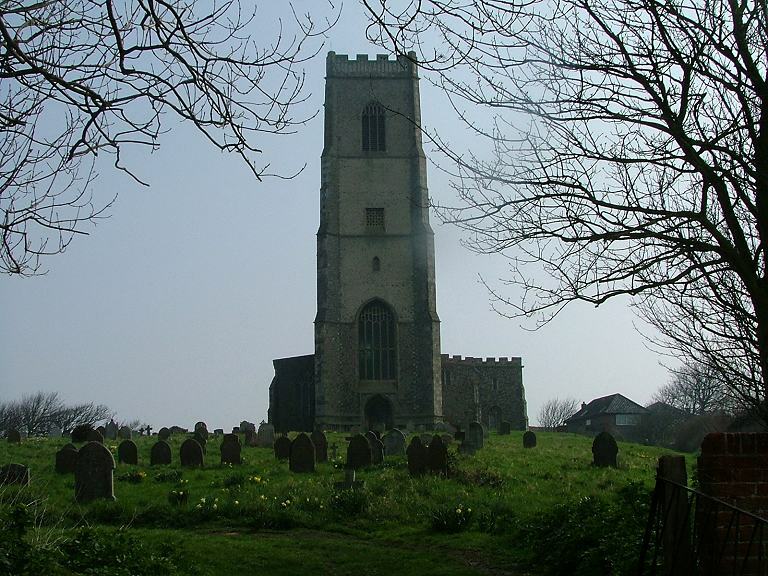 Essentially, the building is perpendicular, but the chancel was never rebuilt, so this stops Happisburgh having the power of, say, Lavenham, where the chancel aisles act as a counterpoint to the tower, squeezing the vast nave in a fierce dynamism. Echoes and traces of the medieval life of the building survive - the curious former entrance to what may have been a chapel outlined at the west end of the south aisle, for example. But Happisburgh is much restored, I fear, most recently in the 1950s to repair wartime damage to the tower. You cannot ignore this church. Simon Jenkins slipped it into England's Thousand Best Churches, Pevsner awards it a whole page and it was in Cautley's top 50 in the 1940s. Nevertheless, Cautley was an architect, and this church is significant mostly for its architecture, as little of artistic or historic value has survived its overwhelming 19th century restoration. The Victorians, perhaps unforgiveably, wanted to create at Happisburgh an urban church, a town church that would rank with those of Norwich or Lynn. And so, what was perhaps once a vast medieval shell like Blythburgh or Salle has become tamed and neutered. Inside and out, their hand fell heavily. You step inside, and at once are swamped by the Anglican triumphalism of the second half of the 19th century. There are medieval survivals - the backlight to the rood at the east end of the nave for example, and the font is excellent, with angel musicians proudly displaying their instruments. But it is entirely recut. Who can say what it looked like before? As you wander around, Mortlock's excellent description guiding you, you will find again and again that your experience chimes with his almost mantra-like much restored... much altered... but I do not want you to think that this is a dull church, or a dying one. One of the delights of this part of Norfolk in general, and this benefice in particular, is that the churches are alive, and full of faith, and very welcoming to pilgrims and strangers. This church is militantly open every day, and on Wednesdays and Saturdays you can even go up the tower. It is clean, bright, well-kept and obviously much loved. It is left to church explorers to mourn what has been lost, the Blythburgh or Salle that could have been here. But would that have made it the living community it is today? Outside, one part of the churchyard is a mound, bereft of headstones. This is a mass grave. HMS Invincible foundered offshore on 16th March 1801 on its way to join Nelson's fleet, and 119 of the crew are buried here. A footnote in history, possibly forgotten; but a 1998 memorial by the local parish remembers it.